Gabe Tockatly asked about an easy and inexpensive way to create a website. As President Obama discovered last fall, building a good website can be a daunting task. But if you don’t require a lot of complex forms that share data with hundreds of insurance companies, it’s actually pretty simple. If you don’t want to learn the technical complexities of modern Web design, or hire someone who has already learned it, find another option. Go with a do-it-yourself online service that provides the building blocks and then hosts the site for you. There will be some limitations on how much you can customize the site design, but the results will still look good and have all of the functionality you need. Note that if you ever decide to move your site to another host, you’ll probably have to redesign it from scratch. If all you want is a blog, go with Blogger or WordPress. But for something more versatile, I recommend Weebly. 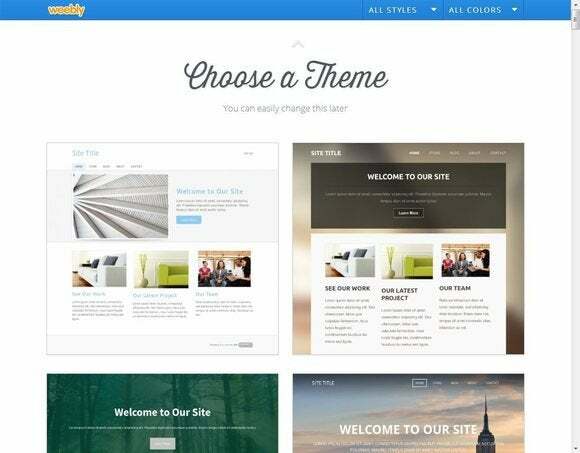 There are a lot of design-your-own-site services, but Weebly is extremely easy to set up. It first asks you if you want to create a site, a blog, or a store. You then pick a template (Weebly calls them themes.) How many themes do they have? I stopped counting at 40. Then you select a domain name--either a subdomain of weebly.com or a full domain of your own. You can acquire a full domain through Weebly, or use one you already own. Now you’re ready to add text, and drag and drop elements into your pages (and, of course, add new pages). Among the elements you can add are buttons, search boxes, images, slideshows, forms, and blogs. Another nice feature: Weebly automatically creates a mobile version of your site, so it can be read easily on a smartphone. You can do a lot with the free version of Weebly. But if you want a serious, commercial site, and one that doesn’t advertise Weebly, you should consider one of Weebly's pay services and get your own domain name.